This is a hardware packet switched network, kinda like IP circa 1951. By Dialing a number, workers in a Connecticut factory can send written messages and even metal samples to various parts of the plant in about a minute’s time. They are using the familiar old pneumatic tube, the hissing clanging gadget used to make change in many department stores. This pneumatic tube is different. Wehere older systems required separate tubes to each station, this one has an automatic dial exchange, just like a modern telephone central office, making a few tubes do the work of many. Each carrier has numbers that can be set to guide it automatically to any one of the nine stations that make up the first American installation at the Housatonic plant of the Bridgeport Brass Co. Eventually there will be 20 stations. In use abroad for some time, the tube exchange was developed in Germany by Mix & Genest, a subsidiary of International Telephone and Telegraph. 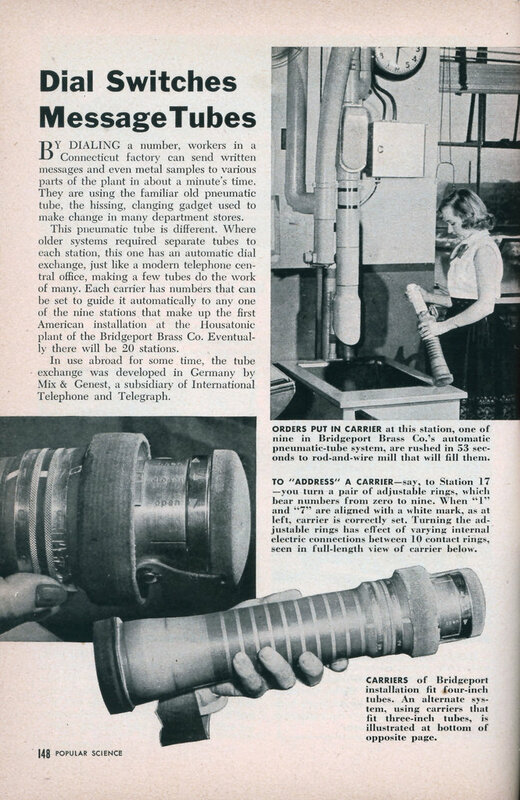 Caption 1: Orders put in carrier at this station, one of nine in Bridgeport Brass Co.’s automatic pneumatic-tube system, are rushed in 52 seconds to a rod-and-wire mill that will fill them. Caption 2: To “address” a carrier – say, to Station 17 – you turn a pair of adjustable rings, which bear numbers from zero to nine. When a “1” and “7” are aligned with a white mark, as at left, carrier is correctly set. Turning the adjustable rings has effect of varying the internal electrical connections between 10 contact rings, seen in full-length view of carrier below. Caption 3: Carriers of Bridgeport installation fit four-inch tubes. 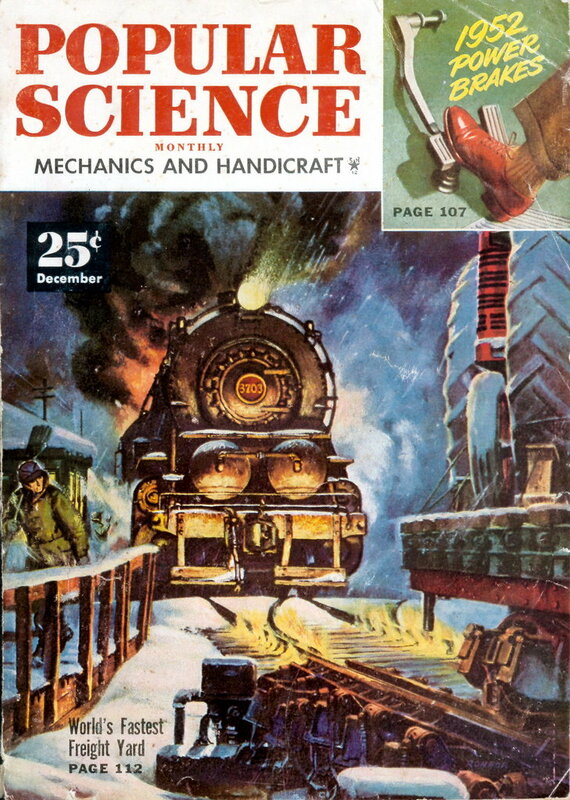 An alternate system, using carriers that fit three-inch tubes, is illustrated at bottom of opposite page. Caption 4: Typical Pneumatic-tube system with automatic exchange has layout like this. Two “loops” of tubing extend in opposite directions from exchange at center. Each loop may serve up to 10 stations (of which three are shown), all equipped both to transmit and receive carriers. A carrier may be dispatched from any station to any other stationl one example is pictured. System has advantages of dispensing with separate tubes from each station to central point and of requiring fewer operators. Caption 5: Metal fingers touch contact rings of carrier and “sense” its intended destination, just before it reaches exchange, as seen through window cut in tube of demonstration setup. Caption 6: “Switches” of exchange, responding to “sensing” device, automatically guide carrier into correct outgoing tube (toward right in this case). Transparent model shows action. This must be what Sen. Ted Stevens thinks the internet is. I was just in TAP plastics yesterday, and they use a pneumatic system. They *love* it. Seems to be the case wherever I go that has a functional system — there are some things that computers just can’t do, or don’t do as well. I guess that, until “beam-me-up-scotty” becomes reality, pneumatic tubes will be around.